Augmented Reality (AR) is a computer-generated image superimposed on a user’s view of the real world through their smart device camera. The user targets an AR marker on their camera at a component in their working environment – digital information is then overlaid onto the camera image using data from a remote server, enabling diagnostics and task performance. 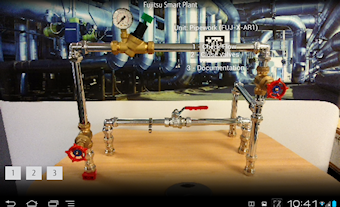 ac&e in partnership with Fujitsu provide a complete AR solution, combining the software and hardware to harness to power of your mobile workforce. PHPSESSID – Preserves user session state across page requests. _NID – Registers a unique ID that identifies a returning user’s device. The ID is used for targeted ads. to calculate the duration of a website visit. collect – Used to send data to Google Analytics about the visitor’s device and behaviour. Tracks the visitor across devices and marketing channels.